While the holidays bring with them fun times with friends and family, they also can feel overwhelming. Shopping for gifts, holiday parties, and family gatherings raise many people’s stress levels. Some patients deal with elevated stress levels by clenching and grinding their teeth at night, also known as bruxism. This may not sound like such a big deal, however bruxism can lead to jaw pain, headaches, and wear on your teeth. Dr. Philip Batson, your dentist in Columbia, discusses the link between stress from the holidays and bruxism. 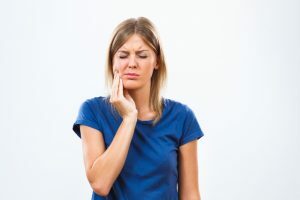 It’s sometimes tricky to determine if you suffer from bruxism since it occurs at night while you sleep, however Dr. Batson can diagnose the jaw disorders or excessive wear to your teeth that are often the result of bruxism. Your bed partner may also report hearing you grind your teeth during the night. Waking up frequently with headaches in the morning is also a telltale sign. Dr. Batson customizes oral appliances to help patients manage their bruxism and protect your teeth from the damage caused by clenching and grinding. Oral appliances can also help relax your muscles, relieving some of the jaw pain and headaches caused by bruxism. At Columbia Healthy Smiles, we understand that every patient is unique and this is why Dr. Batson customizes every oral appliance based on each patient’s individual needs. Mouth guards are comfortable to wear at night and easy to get used to, making them ideal for helping you combat the effects of bruxism. Columbia Healthy Smiles has been providing high quality dental care for patients in MO for over forty years under the guidance of Dr. Batson and his father before him. The personalized attention and care we provide our patients is how we’ve built our reputation over the years, and we’d love to welcome your family into our dental family. If holiday stress is causing you pain, contact our office to schedule your appointment with Dr. Batson and learn how he can help you.